Earlier this summer my husband dismantled a headboard we built about 8 years ago. I was tired of it and had moved it from our bedroom to the garage earlier in the year. He decided to recycle the plywood to build a podium for his classroom so he could have a place to lay out notes and books used during a classroom lecture. Fast forward to Aug and the podium still needed to be finished to be ready for the new school year. First we thought of maps to cover the entire thing. So, last week we drove up to an antique store in Arroyo Grande to look for some old maps. We didn't find many but we did find this big book for $22 (it was about 4" thick when we started). Perfect for a someone who teaches American History. We dismantled the book's signatures in order by clipping the threads (that took some time!). Some pages were glued to the binding so we left those intact and went back to hand cut them from the binding. 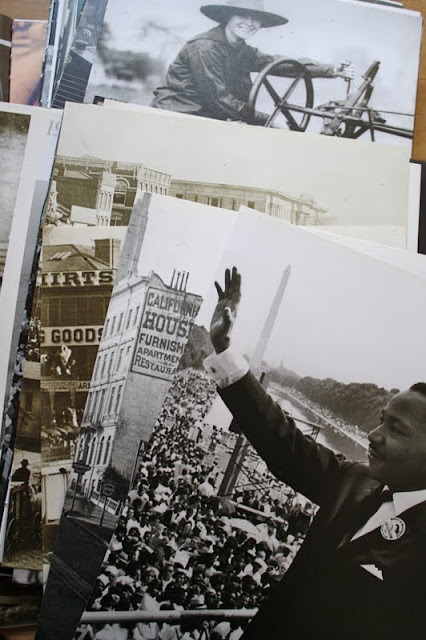 From there, he decided which pictures to use on this project and which significant photos to keep for a giant history timeline that will span a big wall in his classroom, like this picture of Martin Luther King below. 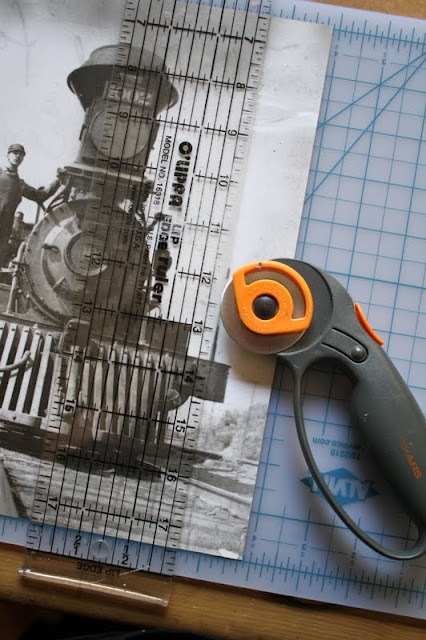 He then cut the photos with my trusty roller cutter and ruler. 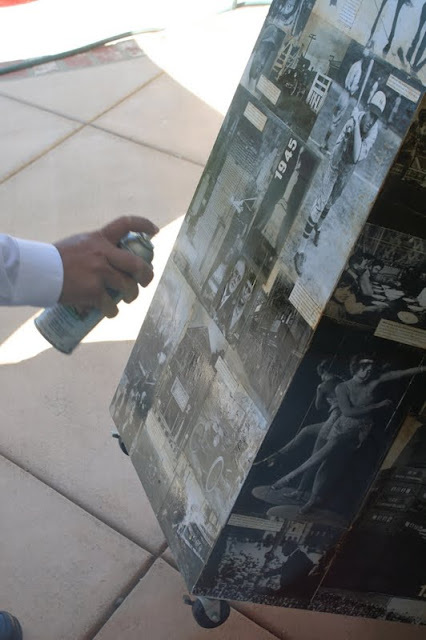 I gathered the cut photos and layered them on the primed wood with Mod Podge. Don't you love that picture of the young John Travolta in Saturday Night Fever? and right next to Richard Nixon! Once the images were good and dry (about an hour), I took a scrap piece of sandpaper and sanded the edges of each picture to make it look rough and worn. Once I was finished sanding one side of the podium I dusted away the paper pulp with a small hand broom then inked the pictures with Distress ink. Note: I used Vintage Photo but it was my old pad which is very used and mellowed in color. Using the ink helped "marry" the images together giving them a universal color instead of some black and white and some sepia tone. 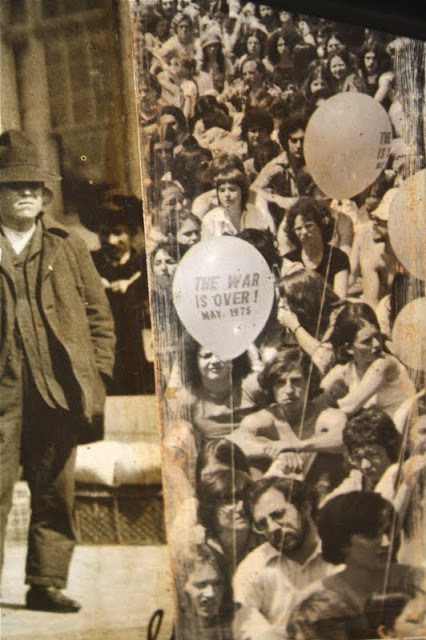 In this picture I used the Distress ink all around, but not on, the "war is over" balloon for emphasis. 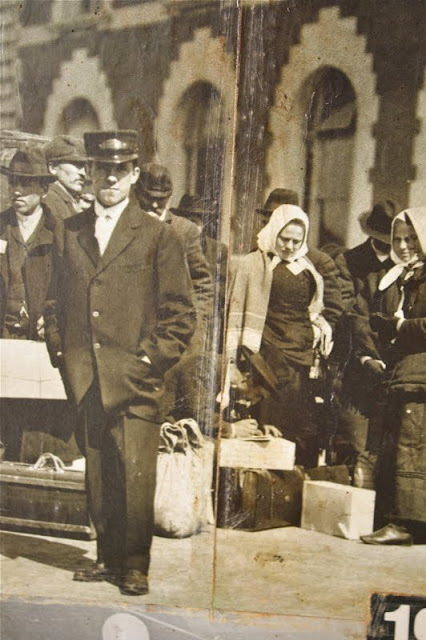 There were a few double page spreads that he wanted to use such as the image of immigrants at Ellis Island. At first I put them together like you would wall paper so the seam would not show, but then in the sanding portion decided it looked better if the center seam was sanded almost like two pictures had been layered one over the top of each other. I always think numbers add to the overall piece so I dug out some old vinyl numbers and stickers in varying sizes to add to some of the pictures that has specific dates associated with an event. 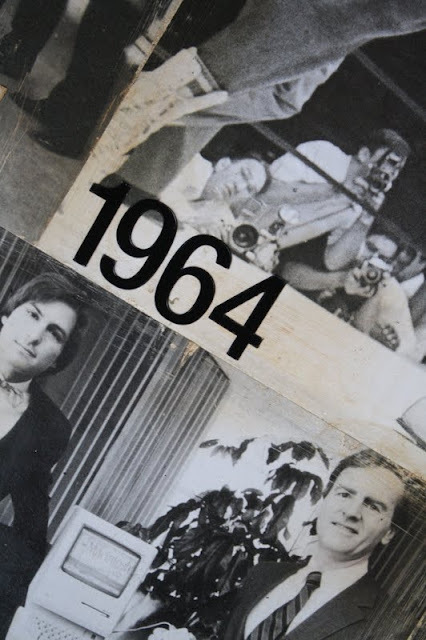 look at the young Steve Jobs and his new invention, the Apple personal computer! btw: The number 1964 above refers to an image of a Muhammad Ali. I used white numbers on the photos that had a dark background (with just a bit of ink). My husband loved the double page spread of Jessie Owens winning one of his four gold medals at the 1936 Olympics in Berlin. We decided it would look great, front and center. 3. 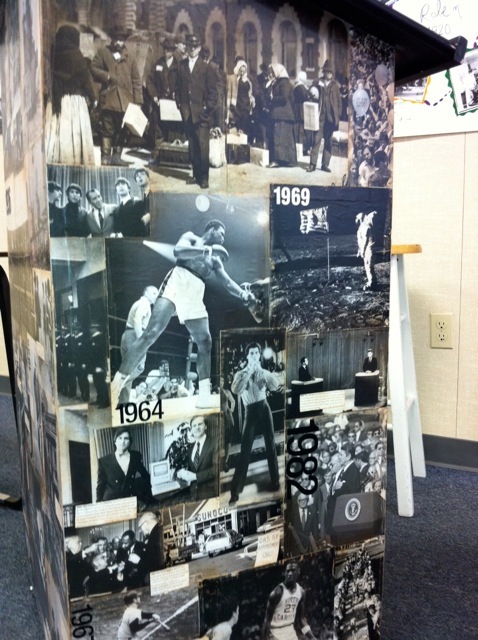 Fill in odd shaped places first (like under the slant at the top of the podium), then layer over the top. 4. Use your hand, a bone folder, or brayer to smooth out the images. No matter what you do, there will be bubbles and that's okay. After about 24 hours of drying the bubbles will disappear and then you'll say, "why was I so worried?" 5. Have a package of baby wipes nearby. Mod Podge is messy and you will need to keep the brayer clean. Here it is waiting to go to his classroom. photos (left to right, top to bottom): Wright Bros plane, women billboard painter during 1920s, 1927 Charles Lindbergh ticker tape parade, Jackie Robinson, first toll roads, Mel Ott, Rockefeller Center being built, 1945 Statue of Liberty re-lit (at night) at the end of WW II, FDR's last inauguration (and son), Cotton Club, early factories, Post office, Model T Ford, etc. 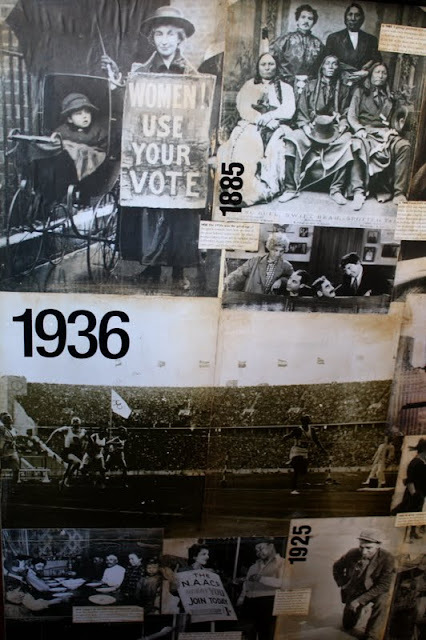 photos (left to right, top to bottom): early suffragette, 1885 American Indian Chiefs and interpreter, the Marx Bros, Booker T. Washington, 1936 Jessie Owens, steel workers, scandalous one piece bathing suits, early immigrant boarding house, NAACP recruitment, 1925 Prohibition, NYC Chinatown, flapper, President Wilson giving a speech, American Stock Exchange, John D. Rockefeller, owner of Standard Oil. photos (left to right, top to bottom) immigrants at Ellis Island, peace rally, Beatles, Muhammad Ali, Moon landing, Steve Jobs & the new Apple personal computer, John Travolta, Nixon/Kennedy debate, 1964 Civil Rights Act -President Johnson and Martin Luther King shaking hands, gas wars or the 1970's, Ronald Regan, 1967 Micky Mantle, Michael Jordan, block party. 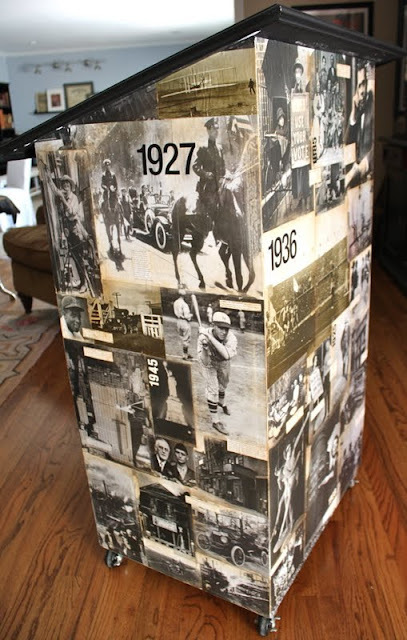 I realize that no one else needs a History podium but I think the same techniques could be used on other pieces of old furniture. Find a book of pictures you like...fashion, flowers, atlas, etc. How about adding the images to a table top or desk top? 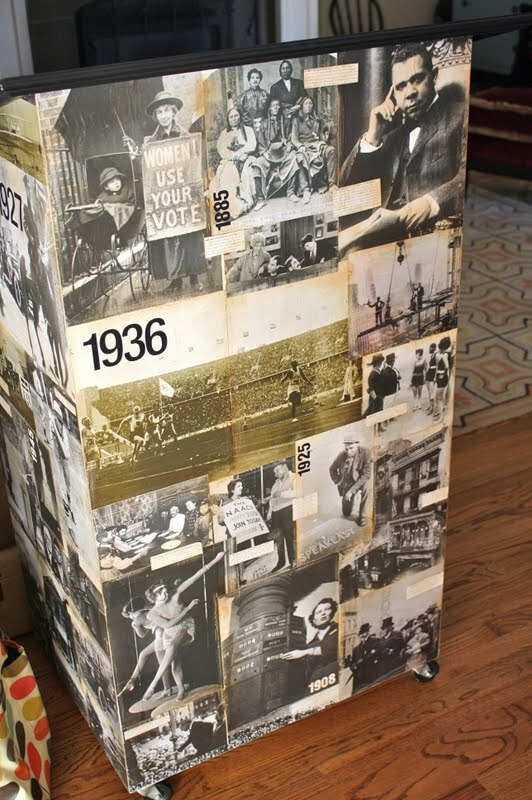 (love to see a "fashion through the years" desk top). When I was in elementary school I went to a friends house for a sleepover. I don't remember the girl's name or even what she looked like. What I do remember is that her mom had taken pages from fashion magazines (can you remember how big the pages of Seventeen magazine were back then?) and layered them on one feature wall in her bedroom. No ads, just the pages that had images of faces. I was truly mesmerized. Of course I asked my mother if I could do the same to my own room but then realized actually how many pictures you would need to create a wall such as hers. I guess I tell you story to say, start small, it's more work than you think. I still love that wall. This is FABULOUS!! What a perfect find (the book) and love that you added the year and placed it within each image - what a visual aid to help students (okay this info is only beneficial when they become adults and use those memorized dates for board games - lol). This is amazing, and love the techniques you used for the final effect. Love that he made the podium as well - incredible job!! Amazing! What an excellent idea for your husband's classroom. His class must be a great one to be in. Thanks for showing us how to do this. I am going to try it. Do you have any plans to teach near Gilbert? I would love it if I could be there but need to know in advance to plan it. I will stay at my daughter's. What a wonderful idea and what an excellent job you did! This is outstanding! More importantly it actually may interest the students and the photos could be topics of discussion or...one included as one of those gimmee quesitons on a quiz! awww WOW. What a cool piece. That should get the kids talking. He doesn't even need a textbook for the year. He can just pick some of these events and tell the importance of them. Wow! That is one amazing piece! ,ales me wish I was back in the classroom so I could modpodge music scores to something. Anything. Love it! Wonderful collage!! The largest thing I ever did was a saxophone case in high school. I loved it and always wanted to do another bigger project. Thanks for the inspiration as always!! Wow! That's a great piece. Good job, Paula and Jay!! This is a wonderful historical piece and turned out fantastic! My first modpodge project was taking old seed packets & putting them on a round wooden cheese box. I loved out it turned out & love to use this stuff! That was over 30 years ago! Really awesome - wonder if it's beauty will be lost on high school kids - let's hope not! OF COURSE the other history teachers are jealous!!! Who wouldn't be? Wow, what an amazing idea and the finished result is fabulous. You two make quite a design team! WOW sooo cool! The kids will totally be into looking at the pictures. You have to wonder if the other teachers will be jealous?! The will be green with envy! First for a podium and then for a one of a kind amazing one! I want to see the timeline wall when that is done! Please!! I am an elementary school teacher but was really excited about the podium...what an inspiration for students to show them how interesting history can be. I have some Life books I bought at garage sales that are just dying to be made into something. Again, what a great way to get students thinking...plus it's cool! I LOVE it! You are so creative! This is a stunning addition to your husband's classroom. I love it! I would love to do some kind of project like this. Thanks for sharing, it's fabulous! Wonnerful, wonnerful....He is gonna love that for years! Really wonderful, I just love this! Wow that is so cool. What a thinking outside the box kinda project. I love that you put that in a real classroom. I know that the kids will be inspired even if they don't know it.